Arriving at Barmouth on the evening of 23 August, Charles met up with a "reading party" of Cambridge friends for a time before he left on the morning of 29 August, to go back to Shrewsbury and on to partridge shooting with his Wedgwood relatives at Maer Hall. He was grieved to have received a message that Ramsay had died. This upset Darwin's plans for a visit in the following year to Tenerife. He arrived home at The Mount, Shrewsbury, on 29 August, and found a letter from Henslow. 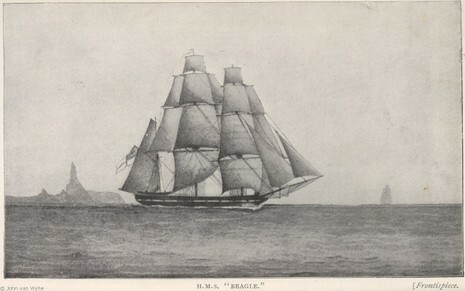 The Cambridge Fellow George Peacock had heard from Francis Beaufort of plans for the second survey voyage of HMS Beagle, and had written to Henslow proposing Leonard Jenyns as "a proper person to go out as a naturalist with this expedition", or if he was unavailable seeking recommendations for an alternative to take up this "glorious opportunity". When Jenyns decided not to leave his parish, he and Henslow thought of Darwin. Henslow's letter, read by Peacock and forwarded to Darwin, expected him to eagerly catch at the likely offer of a two-year trip to Terra del Fuego & home by the East Indies, not as "a finished Naturalist", but as a gentleman "amply qualified for collecting, observing, & noting any thing worthy to be noted in Natural History". The appointment was more as a companion to Captain Robert FitzRoy, than as a mere collector. Henslow wrote "I assure you I think you are the very man they are in search of". His father thought the voyage a waste of his son's time and strongly objected. Dejected, Charles declined the offer, and went to Maer for the partridge shooting with a note from his father to "Uncle Jos" Wedgwood. 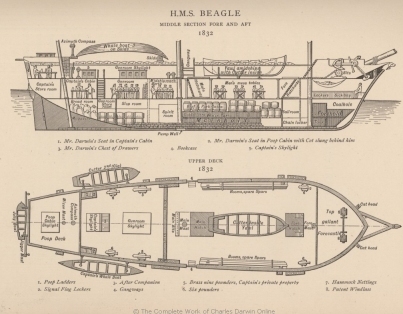 This contained a prescription for a bowel ailment and a note saying that Charles had quite given up the proposed "voyage of discovery", but "if you think differently from me I shall wish him to follow your advice." Charles' hopes were revived by this unexpected news, and his relatives came out in favour of the voyage. He outlined his father's objections, and sat up that night drafting a reply with his uncle. Jos wrote suggesting that Charles would be likely to "acquire and strengthen, habits of application", and "Natural History... is very suitable to a Clergyman." Though "useless as regards his profession", for "a man of enlarged curiosity, it affords him such an opportunity of seeing men and things as happens to few". The Admiralty would look after him well, but "you & Charles... must decide." Charles begged "one favour... a decided answer, yes or no." This reply was sent post-haste early on the morning of 1 September and Charles went shooting. About 10 o'clock he received word from his uncle that they should go to The Mount at once. When they arrived a few hours later, Charles' father had decided that he would give "all the assistance in my power". Beginning on the 27th of December, 1831, the voyage lasted almost five years and, as FitzRoy had intended, Darwin spent most of that time on land investigating geology and making natural history collections, while the Beagle surveyed and charted coasts. He kept careful notes of his observations and theoretical speculations, and at intervals during the voyage his specimens were sent to Cambridge together with letters including a copy of his journal for his family. He had some expertise in geology, beetle collecting and dissecting marine invertebrates, but in all other areas was a novice and ably collected specimens for expert appraisal. Despite repeatedly suffering badly from seasickness while at sea, most of his zoology notes are about marine invertebrates, starting with plankton collected in a calm spell. On their first stop ashore at St. Jago, Darwin found that a white band high in the volcanic rock cliffs included seashells. FitzRoy had given him the first volume of Charles Lyell's Principles of Geology which set out uniformitarian concepts of land slowly rising or falling over immense periods, and Darwin saw things Lyell's way, theorising and thinking of writing a book on geology. In Brazil, Darwin was delighted by the tropical forest, but detested the sight of slavery. At Punta Alta in Patagonia he made a major find of fossil bones of huge extinct mammals in cliffs beside modern seashells, indicating recent extinction with no signs of change in climate or catastrophe. He identified the little known Megatherium by a tooth and its association with bony armour which had at first seemed to him like a giant version of the armour on local armadillos. The finds brought great interest when they reached England. On rides with gauchos into the interior to explore geology and collect more fossils he gained social, political and anthropological insights into both native and colonial people at a time of revolution, and learnt that two types of rhea had separate but overlapping territories. Further south he saw stepped plains of shingle and seashells as raised beaches showing a series of elevations. He read Lyell's second volume and accepted its view of "centres of creation" of species, but his discoveries and theorising challenged Lyell's ideas of smooth continuity and of extinction of species. On the geologically new Galápagos Islands Darwin looked for evidence attaching wildlife to an older "centre of creation", and found mockingbirds allied to those in Chile but differing from island to island. He heard that slight variations in the shape of tortoise shells showed which island they came from, but failed to collect them, even after eating tortoises taken on board as food. In Australia, the marsupial rat-kangaroo and the platypus seemed so unusual that Darwin thought it was almost as though two distinct Creators had been at work. He found the Aborigines "good-humoured & pleasant", and noted their depletion by European settlement. After a few delays, H.M.S. Beagle headed out from Plymouth with a crew of 73 under clear skies and a good wind. Darwin became sea-sick almost immediately. The ship arrived at the port of Santa Cruz, Tenerife Island. The crew was prevented from going ashore due to a cholera outbreak in England. They would have to wait out a quarantine period of twelve days but Capt. FitzRoy would not be delayed and gave orders for the ship to proceed. Darwin was devastated at missing the chance to see the island of his dreams, and watched Tenerife fade off into the horizon. The Beagle arrived at Santiago in the Cape Verde Islands, and anchored at Porto Praya. Darwin went ashore and explored for a few days. Here he made his first "discovery," - a horizontal white band of shells within a cliff face along the shoreline about forty-five feet above sea level. The cliff face was at one time under water. 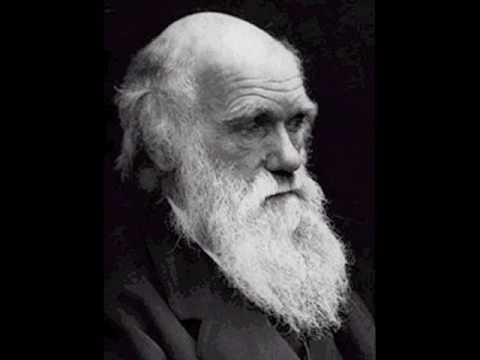 Darwin wondered how it ended up forty-five feet above the sea? He noted that the line was not even horizontal, but varied in height. This supported Lyell's theory of a world slowly changing over a great period of time. The ship stayed at the island for twenty-three days. 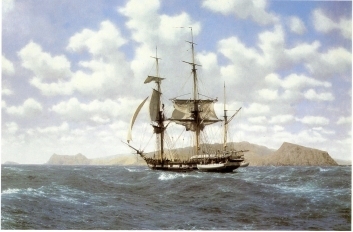 AFTER having been twice driven back by heavy southwestern gales, Her Majesty's ship Beagle, a ten-gun brig, under the command of Captain Fitz Roy, R. N., sailed from Devonport on the 27th of December, 1831. 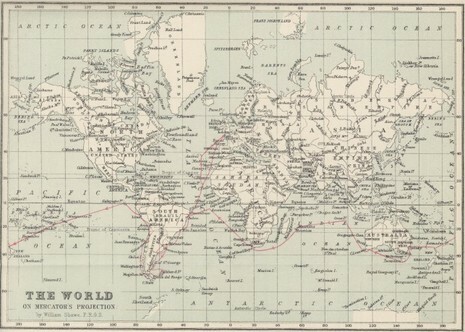 The object of the expedition was to complete the survey of Patagonia and Tierra del Fuego, commenced under Captain King in 1826 to 1830, -- to survey the shores of Chile, Peru, and of some islands in the Pacific -- and to carry a chain of chronometrical measurements round the World. On the 6th of January we reached Teneriffe, but were prevented landing, by fears of our bringing the cholera: the next morning we saw the sun rise behind the rugged outline of the Grand Canary island, and suddenly illuminate the Peak of Teneriffe, whilst the lower parts were veiled in fleecy clouds. This was the first of many delightful days never to be forgotten. On the 16th of January, 1832, we anchored at Porto Praya, in St. Jago, the chief island of the Cape de Verd archipelago. We arrived early in the morning at Port Louis, the most Eastern point of the Falkland Islands: The first news we received was to our astonishment, that England had taken possession of the Falklands islands & that the Flag was now flying. These islands have been for some time uninhabited, untill the Buenos Ayres Government, a few years since claimed them & sent some colonists. Our government remonstrated against this, & last month the Clio arrived here with orders to take possession of the place. A Buenos ayrean man of war was here, at the time, with some fresh colonists. Both they & the vessel returned to the Rio Plata.